The only author I’ve ever personally seen with commercials for his/her books on TV was James Patterson. Now I must add Stephenie Meyer to this list. 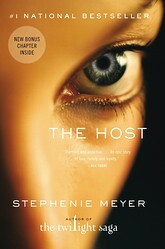 The host really is a good book and after I heard Kassie’s review of it I was surprised at how different my opinion on it was from hers. I LOVE THIS BOOK AND people come on how immature are we that we can’t get through pages of a book we might not understand or want to just give the book a try it’s really worth it. very cool. Love the book. We’ll need to read again when they are ready to film. Totally agree! It doesn’t say anything about what the book is actually about and isn’t that they whole reason for a commercial to get people interested in reading it. Log in | 55 queries. 0.986 seconds.